After shaking up the Western World with the shocking discovery that eating nothing but McDonaldâ€™s food for a month straight does strange things to the human body (and who could have imagined that? ), investigative filmmaker Morgan Spurlock now claims to have shockingly discovered the living remains of underground terrorist Osama bin Laden, underground, so-to-speak, in (or at the very least hiding behind) a so-called Egyptian pyramid. Rumors of his actually not-so-latest shocking discovery have been out there for quite some time now after he showed 15 minutes of super size secret documentary footage at the Berlin International Film Festival in February. But none of the select group of potential buyers present thought that knowing the whereabouts of the worldâ€™s most sought-after man would be all that interesting to the viewing public. Up until now that is, for some strange reason. Perhaps it has something to do with the conviction of three Middle Eastern men in DÃ¼sseldorf yesterday for aiding al-Qaeda in Germany, sentenced to prison terms ranging from three to seven years (meaning six to fourteen months in this country). It was clear even to the ever-skeptical Germans that these men were part of al-Qaeda’s command structure and had been in contact with top leaders, including bin Laden himself. Perhaps the image of bin Laden, whose peculiar name and colorful background have not helped him from having beenÂ almost completely forgotten by the movie-going public in recent years (bin forgotten, so-to-speak), suddenly began to vaguely ring a bell in the minds of potential ticket buyers again. Perhaps not, itâ€™s hard to say for sure. 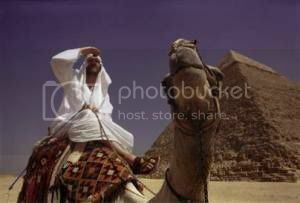 No user commented in " Bin Laden Suspected of Hiding in Pyramid "